One of the most powerful ways to build an audience or an army of advocates for your company, cause or campaign is to offer quality, relevant content to your target groups. This approach demonstrates your value and drives positive engagement with your organization. First, you are an expert who can help others. Second, you must give away some of your expertise. Yes, this is heresy to many businesses, especially service businesses, where the billable hour is king. Giving away your expertise cheapens your value, commoditizes your service, and fails to build your network, right? Ever bought a car before test-driving it? Purchased a nice suit or dress without trying it on first? Got married before the first date? Doubtful. Sharing your content, your expertise, or your story draws people to you, and creates a connection based on shared value or experience. Commit to sharing enough of your expertise to show your audience that you are an expert and more importantly, that you can provide a solution to their needs. What The Heck is “Content” Anyway? Content is anything you create that tells your organization’s story and helps your audience solve a problem. In some cases, content builds a case for your service, solution, or issue. In other cases, it may not relate to a specific product or service, but it positions you as a trusted voice on your subject matter. Content can be blog posts, infographics, podcasts, videos, images, key message statements, or position papers. This post from Convince & Convert offers tons of ideas. Lists of resources your audience might find helpful, commentary on an industry trend, or “how-to” guides are all great places to start developing content. The key is to create information that will be attractive to your target audiences. Once you create this content, you can promote the content across your various communication channels. Over time, quality content will attract interested people who will soon become customers, clients and supporters. Ready to start a content marketing program? Remember, a solid content program does not happen overnight, so give yourself time to produce, refine and distribute your content. It is a process that over time will build you a ready-made audience for your company, cause or campaign. But here’s how to start. Identify the questions your prospective customers or clients ask you the most. A great example of a content map. This will be the basis of your content program. Answering the questions your prospective audience has (even before they ask you) will build trust and eventually speed up your sales cycle. Spend some time listening to the questions your salespeople or customer service reps receive on initial calls from customers. You’ll see some patterns that can start your content-creating juices flowing. 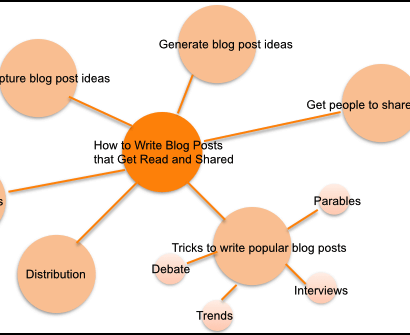 Use mind-mapping to brainstorm topics and subtopics to create several options for blog posts, emails, social campaigns, and articles. Pick a topic, tactic, or subject that you can write about, and which your audience cares about. Start writing. The important thing is to take time from the start to map out what questions your customers have and how you can best answer those questions. Then, create a timeline for producing and communicating that content on an editorial calendar. Schedule your content on an editorial calendar. While it sounds really specific and technical, an editorial calendar is just that – a calendar. Just like your office calendar that holds appointments, projects, meetings or important due dates, the editorial calendar serves the same function for your content. Editorial calendars are typically managed on a spreadsheet, an actual calendar, or an online app like CoSchedule. 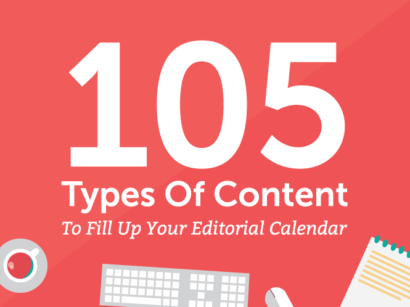 It’s important to remember that your editorial calendar isn’t only for scheduling content creation. Your calendar should also schedule content promotion and distribution. 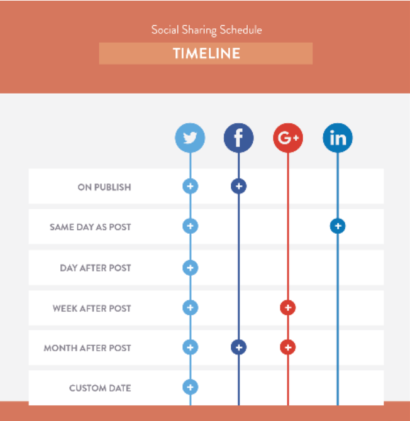 CoSchedule has a great social sharing calendar. A properly managed editorial calendar will simplify your content efforts, by scheduling and planning your content development, distribution and promotion. For more information, CoSchedule has a great in-depth article on building a data-driven editorial calendar. Make content a priority for everyone. While your organization may have one person focused on writing, posting, blogging, or managing your social media or media relations, content is everyone’s job. If you went to a family doctor, and she said you needed a heart procedure, you would go to a cardiologist, right? In the same way your organization will have experts on products, customer service, research, or other subject matter. Those people may not be writers, or marketing “types,” but they have answers to the very questions your customers are asking, so use them! Set clear expectations for your entire team to assist in creating content, developing new ideas for blog posts or infographics, and collecting interesting websites, articles, or quotes from happy customers or satisfied constituents. Create a process for your content creator(s) to intake those content ideas and then produce great material that is relevant to your consumers or clients. Finally, understand that creating content – and achieving results – takes time. It won’t happen overnight, but a sustained content program will create leads, build your reputation and shorten your sales cycle.